I hope everyone is having a great week! I would like for you all to join me in congratulating the Faculty and Staff Members of the Month for March. These outstanding team members have gone above and beyond the call of duty for the betterment of our district. If you see them in your hallways or on your campuses please congratulate them. 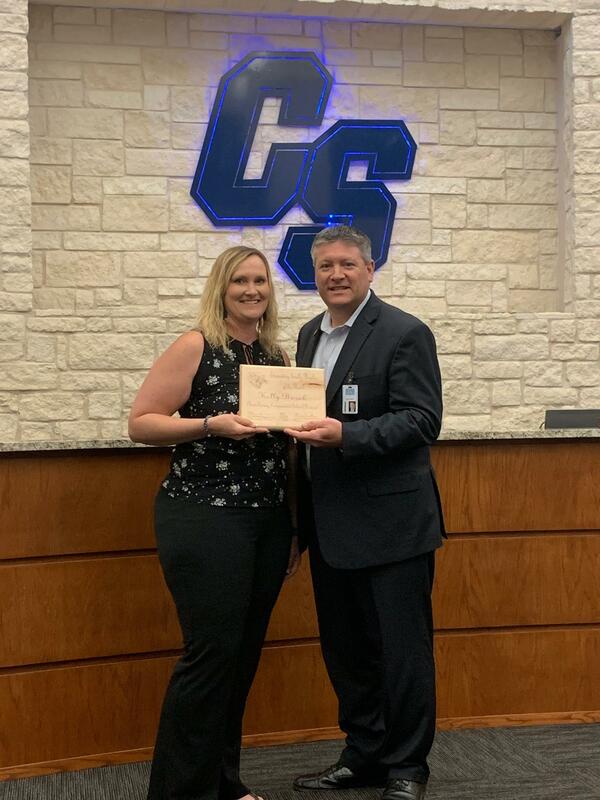 Elementary Faculty Member of the Month – Congratulations to Mrs. Kelly Barak for being nominated and selected as the Elementary Faculty Member of the Month. She is a relative newcomer to CSISD but has come in and done a tremendous job teaching 5th grade math and working with her 5th grade team. She is quiet but dedicated, creates a classroom environment of high expectations, and has done well with our inclusion team of teachers and students alike. Kelly is a flexible team player that is always willing to help a partner out. She looks to try new things with her cohorts to engage students like Goose Chases and Math Stations. We appreciate her level of commitment to China Spring students and families and are glad she joined our CSI team! Her fellow teachers Mrs. Hoiten and Mrs. Mayes state “Kelly is such a great teacher! She brings her best every single day, teaching her students with a bright smile and a positive attitude! Her ability to understand the individual needs of her students and meet those needs with tons of caring and kindness is just one of many things that make her so amazing! She is such an asset to our campus and I’m thankful every day to have her on not only on the 5th grade team! Kelly is always ready to learn new ways to present math concepts to her class. She puts together games and uses technology to insure learning in her classroom. Kelly has embraced using centers to give students opportunities to practice math skills while using guided math to work with small groups. Kelly has a great rapport with her students and high expectations. China Spring 5th grade is blessed to have her as a part of the math team. So Congratulations to Kelly Barak! Secondary Faculty Member of the Month –Congratulations to Cody Corntassel on being selected as the Faculty Member of the Month. Cody is an outstanding athletic trainer and does an unbelievable job with our student athletes. He not only makes decisions about athletic injuries, but he spends a tremendous amount of time helping our athletes with rehab, thus getting them back on the field or court as soon as possible. Due to his outstanding performance with rehabbing our student athletes they do not have to miss school time for rehab appointments during the school day. Cody is the best athletic trainer that I have had the opportunity to work with in my coaching career. He gets to work every day by 7:00 am and usually never leaves until late at night due to his dedication to the program and our student athletes. Cody spends extra time working with our basketball teams and soccer teams with sport specific drills as well as working hand in hand everyday with our strength and conditioning class. Our coaching staff truly respects Cody for his hard work, dedication, and professionalism. Cody has quality written on everything that he touches and takes on. 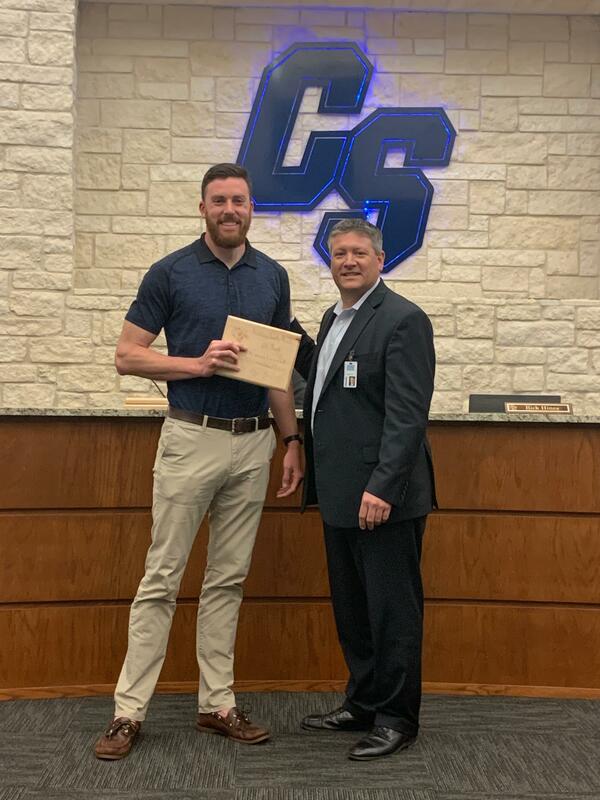 Once again, Cody is a “Fantastic Athletic Trainer and Employee for China Spring ISD!” So congratulations Cody and we are blessed to have you! 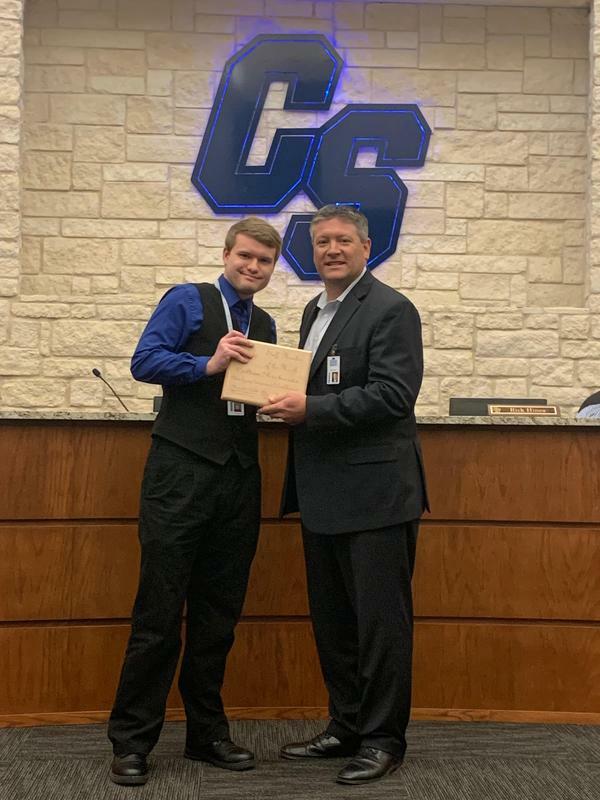 Staff member of the Month for March - Congratulations to Colton Richards for being selected as Staff Member of the Month for the month of March. Colton is a dedicated hard worker as a Systems Technician I. He has started his second year in a professional technical position and over his time here he has shown tremendous growth both personally and professionally. "Colt" is literally our work horse. One day I saw an increase of work orders come in from the High School campus and decided to help Colton. When I asked if he needed help said, "No. I got it covered." I thought to myself, "He must not have seen all the work orders from the HS campus." Turns out in the time that all those work orders came in he had reached out to each teacher and scheduled a time to visit with them or had assisted them remotely and resolved their issue. When asked about Colton, Ms. Cheryl McDuff stated, "Whenever I have a problem with technology, I kind of panic. But Colton always comes quickly, ready to figure it out. I appreciate that Colton is always willing to help with my classroom needs, and he does it quickly." And Mrs. Heather Jenkins stated that, "Colton Richards is a fantastic technology friend! He helps with absolutely anything that is asked of him, sometimes it’s not even really tech related like just turning a knob for volume, and he never judges or laughs at you when it’s that simple of a fix. We appreciate his quick competent responses to our constant needs!" The tech department is proud to have Colton as a member of the team. He's proved himself an asset to the district and is well deserving of Staff Member of the Month. Congratulations Colton!